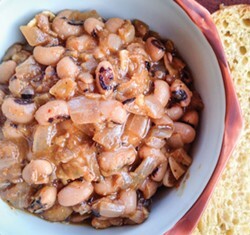 Spicy, hearty Ethiopian black-eyed peas. Where do black-eyed peas go after being at the center of the New Year's table? Are they put away in the back of the pantry for a year, like Halloween costumes in the back of the closet? In Italy, lentils are the legume that brings good fortune and money in the New Year. My mother always prepared a pot of the prized small lentils from Castelluccio di Norcia (a village in Umbria, the region where I grew up) as a hearty yearly insurance policy. But she also cooked lentils at other times during the year, so after her death, I was not surprised to find a package of them in her pantry. The small bag of black-eyed peas (fagioli dall'occhio in Italian) next to the lentils though, surprised me; I didn't know she liked them and I have no idea how she prepared them. When I decided to try cooking black-eyed peas, I let myself be inspired by Ethiopian cuisine, in particular messer-wot, the red lentil stew spiced with the traditional mix called berberé, a favorite of mine. The beautiful color and intense fragrance of the berberé are exhilarating: First you taste the heat from chilis and black pepper, but it soon mellows into a rainbow of spices, including fenugreek, ajwain, allspice, cardamom, ginger and turmeric. You can make your own berberé spice mix but I decided to purchase some. With that and a handful of ingredients, this is an easy dish to make. Now that spring has started, I like to serve the spicy stew with some sugar snap peas, the ultimate "green" vegetable, in the sense that very little is discarded in the trimming process. My favorite way of preparing sugar snap peas is roasting them with shallots. As a little aside, black-eyed peas and sugar snap peas are two different species. Sugar snap peas are a variety of peas, Pisum sativum, while black-eyed peas are a type of cowpeas, Vigna unguiculata. If you visit my home region of Umbria, besides the Castelluccio lentils I mentioned earlier, you may want to taste some of the other locally grown legumes, including fagiolina del Trasimeno (cowpea of Lake Trasimeno), cicerchia, Colfiorito lentils and roveja peas (Pisum arvense). Rinse the black-eyed peas then place in a saucepan with the water, bayleaf, kombu, parsley stems, onion, garlic and salt. Cover and bring the water to a lively boil quickly, then turn down the heat and let the black-eyed peas simmer until they are tender but not too soft. Taste them after 20 minutes and estimate how much longer they should cook. 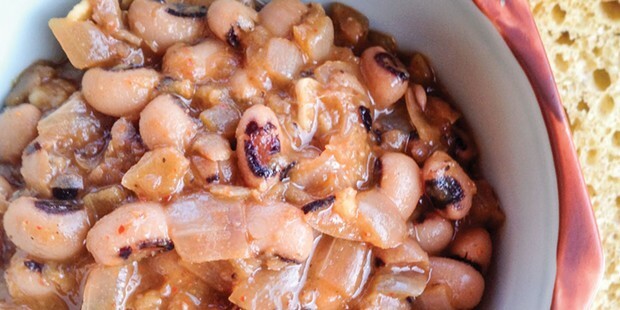 Let the black-eyed peas cool in their broth, then remove the aromatics and discard them. Set aside until ready to use. Warm up the coconut oil in a saucepan and add the onion. Stir well to coat. Cook on gentle heat until the onion is translucent, 10-12 minutes, stirring often. In the meantime, grate the ginger and drain the black-eyed peas, leaving them moist and reserving the cooking liquid. Add the garlic and ginger to the onion, stir well and continue cooking for a couple of minutes until fragrant. Sprinkle the berberé on the onion and stir well. Continue cooking for a couple of minutes, stirring often. Add the black-eyed peas to the onion and stir. Add ½ cup of the cooking liquid and stir. Cover the saucepan, bring it to a boil, then turn down the heat and simmer until the peas are quite tender and the onion is soft. Season with salt and give it a final stir. Serve hot. Remove and discard the stem end and the string from each pod. In a bowl, toss the snap peas and shallot with the olive oil to coat well. Transfer to a baking sheet lined with a silicone baking mat and spread in a single layer. Roast in the oven for 20 minutes or until the peas are tender to your liking, stirring them once after 10 minutes. Season them with salt and pepper, stir well and serve warm.